I just recently started in on the problems at Project Euler - a set of math & programming problems for students and others who might like to solve them using short computer programs or pencil and paper. 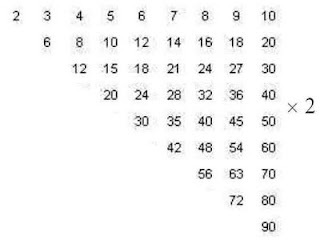 I haven't tried many problems, but I liked #6 because there is a nice way to state the problem using polygonal numbers, and a nice way to visualize it using the multiplication table. Find the difference between the square of the sum of the first one hundred natural numbers and the sum of the squares of the first one hundred natural numbers. Find the difference between the square of the nth triangular number and the the nth square pyramidal number. Playing around with pascal-like-triangles (like I tried to do here and here) is one way to convince yourself that this formula does make sense, and you could use it to solve the problem directly. This is nice, but what's nicer is that there is a simple way to visualize "the square of the nth triangular number" and that you can also find "the nth square pyramidal number" within that visualization. 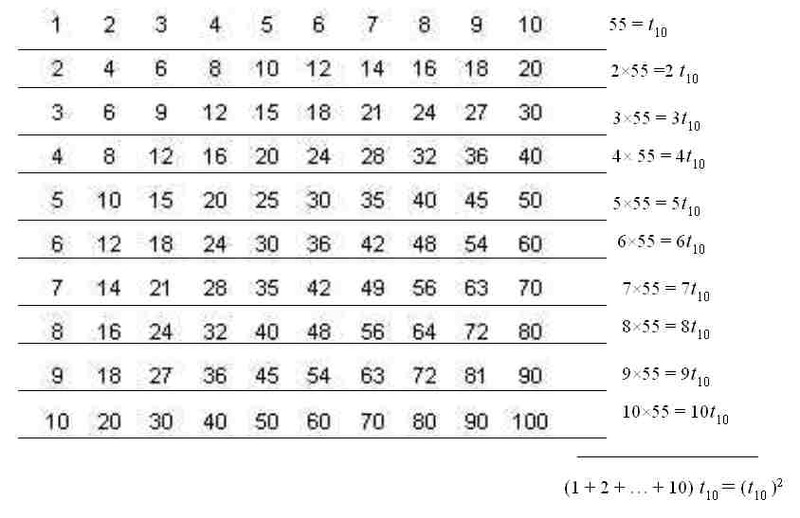 Consider the standard grade-school multiplication table. Say for example, the 10 by 10 variety shown below. 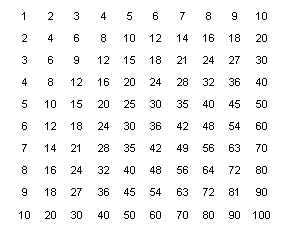 If you sum all of the entries in the n by n table, you get the square of the nth triangular number. So, the whole n by n table represents the square of the nth triangular number. 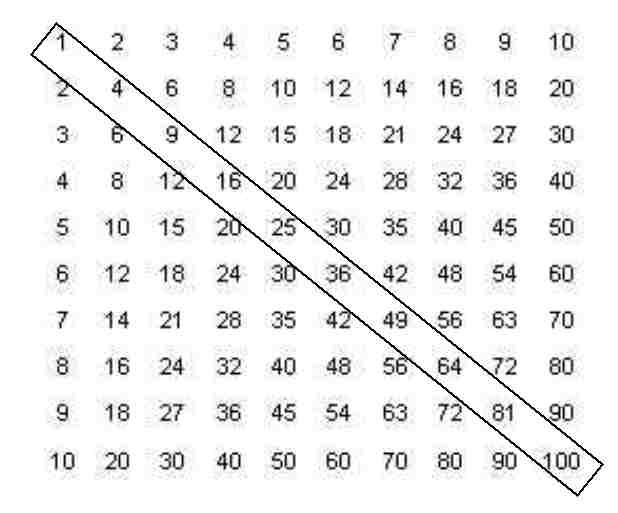 Inside the table, you also get the nth square-pyramidal number - this is the sum of the entries along the downward sloping diagonal. 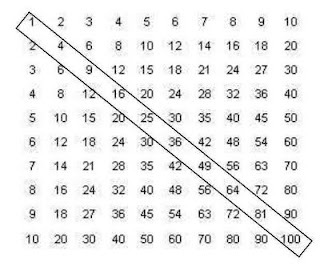 We can think of the problem as finding the sum of all entries in the multiplication table, taking away the entries on the diagonal. Since the table is symmetrical along this diagonal, we can cut this down a bit by finding twice the sum of the "upper triangle" of the table. 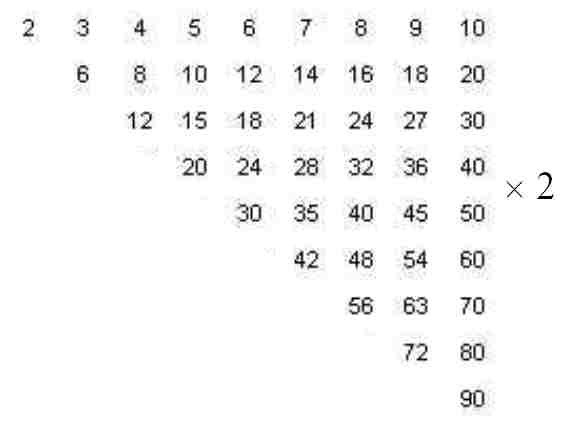 There are some other nice connections between polygonal numbers and the multiplication table. 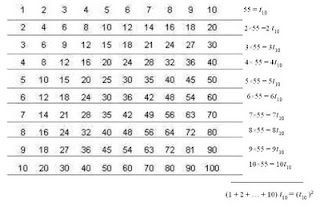 For example, the well known "a square number is the sum of two triangular numbers" relationship can be found inside the multiplication table, and so can the triangulo-triangular numbers (4-dimensional triangular numbers).